When my daughter was born I took infant CPR. A few years later, after two more children, I retook the training and also took an additional course for older children. In our bathroom we kept a book on first aid. Though I couldn’t prepare for every calamity that might befall us, I felt I was doing my best to protect my kids should we face somethings along the lines of a choking or broken bone incident. I did not take Mental Health First Aid. It did not exist at the time. Had it existed and had I known about it, I would like to say I would have included it in the list of things to have in my parental preparedness kit, however, it’s doubtful. While equipped with a good amount of mothering basics, I was less equipped with the necessary prescience and understanding for this. CPR training? Of course! Mental health? Hmm. I already knew a little on the topic plus, we were a stable, happy family. I imagine my younger self would have felt that kind of training best for more complicated families. Mental Health First Aid is an 8-hour course that gives people the skills to help someone who is developing a mental health problem or experiencing a mental health crisis. Regular first aid courses teach the initial help to offer an injured person before professional help can be reached. Similarly, Mental Health First Aid is the initial help given to someone experiencing or developing a mental health problem before appropriate treatment and support can be gotten. Mental Health First Aid training arrived on the scene in 2001 in Australia and came to the US in 2008. Now taught in more than twenty countries, over one million people in the US alone have been trained. Personally, I prefer the term “Brain Health”. The word “mental” invites associations such as “crazy” loony” “whacko…” making it more difficult to evolve past archaic and erroneous beliefs. Mental health issues are brain issues. Mental illness affects a person’s thinking, emotional state and behavior. Indeed, what controls our thinking, our emotional state and our behaviors? Our brains do. Also, the brains of people suffering from depression, bipolar, trauma and other issues show marked differences from brains that do not suffer from these conditions. Both genetics and environment play a role in whether a brain will be healthy or unhealthy. There is no stigma or shame in treating a broken leg, a diseased liver or an ailing heart. The same needs to hold true for treating an unwell brain. 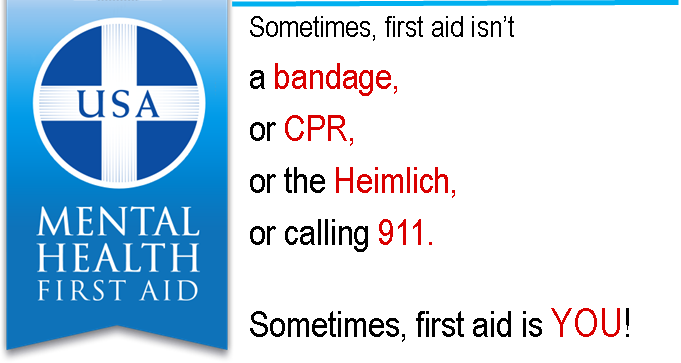 Given that one in four people will suffer a brain health crises at some time in their lives, many of them young people, Brain/Mental Health First Aid should be part of every parent’s “first aid” preparedness kit. The truth is a brain illness, like any other physical illness, can and does affect all kinds of families: stable, unstable, loving, broken, affluent, poor, etc. Understanding how to recognize warning signs and how to best respond if and when it happens to a loved one can make a tremendous difference in the life of that loved one. 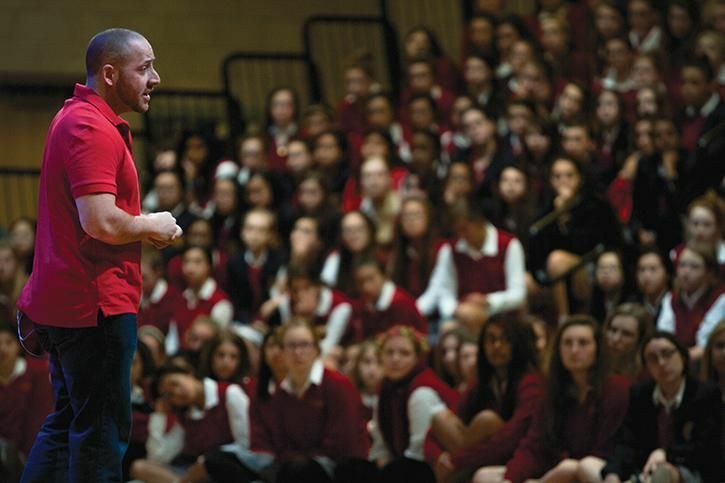 Filmmaker and storyteller, Kevin Hines openly shares the struggles he has had with brain illness and substance use. In his junior year of high school, Hines was diagnosed with bipolar disorder. In September 2000, Hines attempted suicide by jumping off the Golden Gate Bridge. He survived the 220-foot plunge and is one of only 34 Golden Gate Bridge jump survivors. As part of his work to help others, Kevin shares the ways that the concepts from the Mental Health First Aid action plan were or could have been helpful to him. Participants in the Youth Mental Health First Aid course watch Hines’ story to learn strategies to help young people who may be experiencing a mental health challenge or are in crisis. At a recent Mental Health First Aid training I attended, there were three police officers present. Each was not only taking the course, but also was becoming certified to teach the course to their fellow officers. 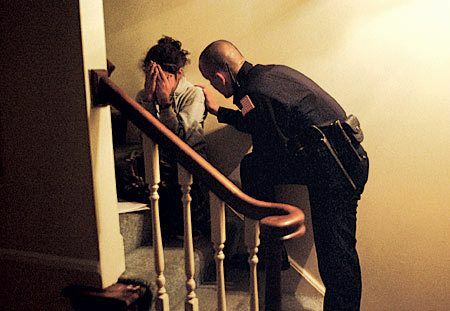 On a break in the hallway, the officers shared that they felt this growing movement to understand brain illness and to respond more compassionately to an individual who may be experiencing a brain health crises is the way that law enforcement is ultimately headed. Another officer spoke of how a number of her colleagues, particularly the younger ones, were embracing therapeutic activities such as yoga for first responders and trainings such as Mental Health First Aid. Before I took training, if faced with trying to help someone who may be suicidal, I would never have directly asked if they were thinking of killing themselves and if they had a “plan.” Why plant the idea?! Learning how wrong I was was one of many valuable takeaways. Also, behaviors in my children that may have previously elicited punitive or harsh reactions, I now recognize may signs of a more pressing brain health issue. Regardless, learning how to truly listen to my kids non-judgmentally and to effectively offer reassurance was invaluable whether there is a brain health issue or not. For parent of kids who have undergone a trauma or adverse childhood experiences, Brain Heath First Aid skills are indispensable. In 2015, President Obama publicly remarked that all teachers should be trained in Mental Health First Aid. Shortly thereafter, the town of Newtown, CT did just that. Thanks to the efforts of two local organizations, The Avielle Foundation and, The Resiliency Center of Newtown, The Newtown/Sandy Hook school district is the first district in the country in which all teachers either have been or will soon be Mental Health First Aid certified. Why is it so many parents are trained in CPR and first aid, aware that they might have to act quickly should a child start choking, suffer a burn or a concussion or break a bone, yet they are less aware of how to respond should their child experience a brain health crises? – A situation equally if not more likely than many bodily injuries. I imagine lingering stigma and misinformation play a large role. Fortunately perceptions appear to be changing, albeit slowly. Brain Health First Aid training helps parents understand the difference between “sadness” and suicidal thinking; trauma symptoms and ADHD (which often mimic each other) and acute anxiety and normal stress. I wish I had gained this knowledge as a young parent, it would have helped navigate a few storms a little more smoothly.